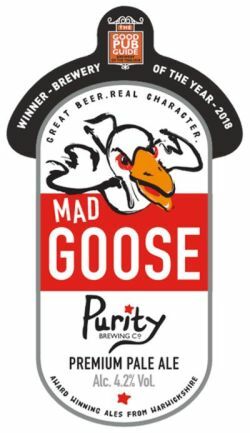 Mad Goose a zesty pale ale with a smooth and citrusy finish. Brewed with English Maris Otter, Caragold and Wheat malts, with Pilgrim bittering hops and Cascade and Willamette aroma hops with an IBU 48. UPDATED: APR 20, 2019 Half pint from cask at The Broom Tavern (B50 4HL), 2019-04-08. Appearance is a clear pale amber with a thick, long-lasting creamy white head. Aroma is mostly notes of citrus and hops, with a touch of floral. Quite pleasant. Taste is similar. Pleasant fruitiness with a bitter hit from the hops towards the end. Palate is light to medium bodied. Short finish but nice and silky in the mouth. Overall, a reasonable pint. Colour doesn't really match with the expectations from a pale, but everything else is pretty good. UPDATED: JAN 31, 2019 Cask at the Water Poet I'm Liverpool street, London. Some hop flavours, slightly macro tasting. UPDATED: JAN 10, 2019 Cask at The Merchants, Rugby, Warwickshire, England (£1.75/half). Poured a crystal clear dark amber with 5mm of dense white foam that retained very well and laced very well. Aroma subtly of citrus. Taste slightly of citrus with no real bitterness. Light body with a slight ly watery mouthfeel. Smooth and slightly creamy with a short finish. UPDATED: JAN 12, 2019 From cask at Park, Bletchley, 09.01.18. Served withoutsparkler. Clear golden. Foamy beige head. Refreshing aroma of lemon zest, lime zest, lychee and tamarinds. Taste of bitter marmalade, grapefruit, lime and lychee. Pine bitterness is lingering on. Good! Cask at George and Dragon, 22nd October 18. Pours clear copper. Aroma is caramel, malts. Taste follows, not a bad one. UPDATED: AUG 1, 2018 Pale gold amber, lasting white head. Aroma is somewhat indistinct- definite malt with the hops. Taste is bitter with a good long finish. Cask - clear golden amber with decent head. Good mouthfeel, not much aroma. Good balanced taste and lasting. W zapachu g?�wnie wymiociny. Bursztynowe, niska piana. W smaku lekka goryczka. Przeci?tny ale. UPDATED: AUG 27, 2017 Cask at the Mason’s Arms, Devonshire Street. Pours clear golden with a white head. Aroma of malt and hops. Sweet taste and finish. 746313 Cask pint at the Coronation Hall, Surbiton. Pours clear golden with a white head. Aroma of malt with caramel. Sweetish taste and finish. Have had better pints but will rate as is.